It’s Saturday, 4 October as I sit down to scribble out this rather late edition of this column, and as I do so, I’m caught up in a mistral of thought blowing loudly through my head, matching its speed with the activities of the previous month. In the small winery at which I am seasonally employed, we’ve just taken in the last grapes we’ll process this year. It’s been exhilarating, exhausting, challenging. 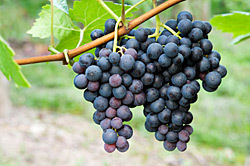 Harvest came early for the Pinot Noirs that we do, and the grapes, always on their own schedule, following the whims of nature, came fast. What took place over six or seven weeks last year happened during just under four weeks of September, leaving only some Zinfandel stragglers to arrive on the first day of October. The month was filled with long days of dark to dark early risings (which, as a nocturnal creature, is not in my nature) and late homecomings, sorting, fermenting, punching down, babysitting, temperature monitoring and adjustment, testing sugars, sealing, barreling. I’m often amused by the reaction of people when they learn that I work making wine, thinking it a glamourous thing; the stains on my nails, my hands, my jeans , the aching muscles, the constant fatigue are anything but that. It’s satisfying work, though. At the end of a day, there’s something real that can be pointed to. That. Over there. That’s what we did today. After many months of resting in beautiful French oak barrels, the precious fluids will be bottled for at least another year’s slumber before being released, to finally be enjoyed, lingered over for many years to come. Deep satisfaction and instant gratification often don’t go together. 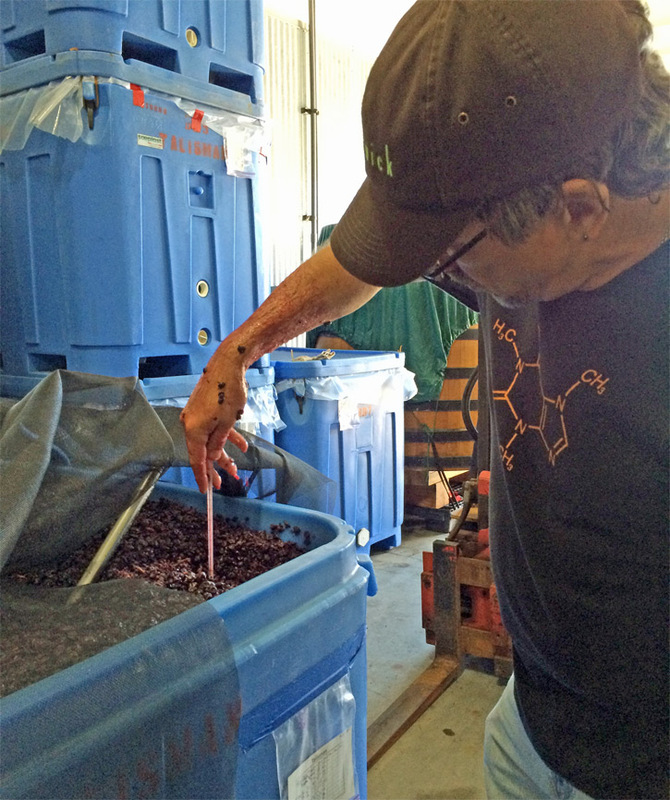 Gregory L. Pease taking the temperature under the cap of some fermenting Pinot Noir. And, as I write, I’m puffing on the first production samples of a new blend I’ve been working on for almost a year, and thinking about for quite a bit longer. Blending tobacco is a different process, in some ways more cerebral, not nearly as tiring or back-aching, and it generally happens on a shorter time-table, but when I get to experience the first example of the final product, the reward, that feeling of satisfaction is equally palpable. From the beginning, I’ve always designed my blends specifically with aging in mind. As with fine vins de garde, fine tobaccos must be delicious in their youth, of course, but will continue to evolve, offering something new and exciting to those who have the patience to let them rest for a year, two years, ten. I often find my thoughts meandering through the fields of the similarities between wines and tobaccos. Once again, there’s more than a little truth to be found in those thoughts. I read that some time ago you did a few tests to see how ambient humidity would affect the water content of pipe tobacco and found that 60% RH would translate into a 12% water content. With this in mind, and being that I’m just too whimsical in my smoking to know whether I’ll be able to air out a blend for several hours before smoking (I live in an island, blends take a while to air out here…) wouldn’t it be a good idea to toss a small, 8-gram 62% Boveda pack inside each mason jar and that way the tobacco would always be at the perfect water content and ready to smoke at a moments notice? Is there any reason I’m not seeing which makes this a bad idea? Thanks a lot for your time, your excellent column and your delectable blends! A: Thank you for the kind words, and for the interesting question. I’ve not done any experiments using these humidification packs, so I can’t offer anything concrete. It should work fine, but be aware that there might be some risk. If the tobacco is put into the jar with higher than ideal moisture, the pack might not "take up" enough of the excess moisture to bring the level down to the safe zone, and mold might bloom, especially in warmer climates. On the other side, I’ve occasionally seen humidity "pillows" develop mold spontaneously, which can adversely influence the taste and aroma of the tobacco. My suggestion would be to proceed with caution. Try it with a small amount of tobacco in a jar, and monitor it closely, removing the pack at the first sign of contamination by unwanted growth. If things get all fuzzy and ugly, you’ll have to throw the tobacco and the humidity pack away, and clean the jar with a little bleach, followed by vinegar, and a thorough water rinse. Forrest writes: In reading reviews of straight virginias, in particular ones which have been aged, I’ve seen many reviewers talk about the nicotine kick in these tobaccos. This has confused me; I’ve been told repeatedly that virginias have very low nicotine content. Do they somehow gain nicotine when aged, or are the experiences of these reviewers due to a lower nicotine tolerance in some individuals? A: A very interesting question, and one for which I’ve never found any sort of definitive answer. It’s not clear what’s going on in these cases, but one thing is certain; once tobacco is harvested and cured, halting its metabolic processes, the plant is no longer able to synthesize nicotine, so its level is fixed. Since it is somewhat volatile, it can be lowered slightly through various means, such as steaming, panning, toasting or stoving, but its concentration can not increase. 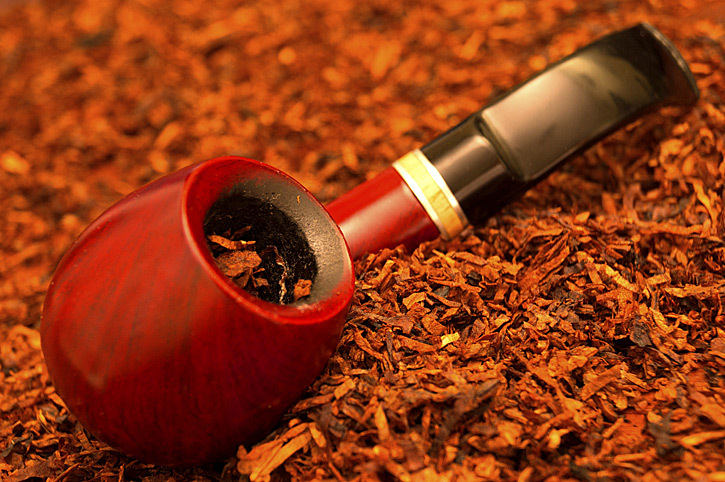 Aged tobaccos, therefore, cannot have a higher nicotine content than they had when they were first produced. Of course, there’s more to the picture. 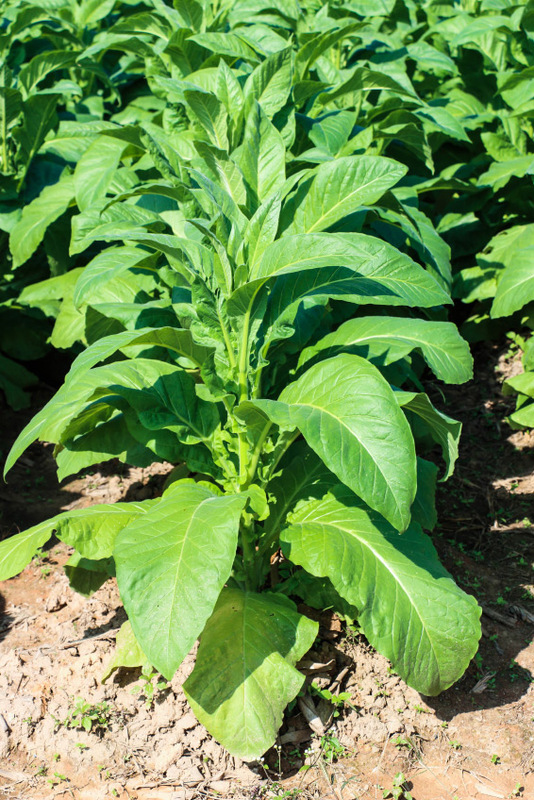 A tobacco plant’s nicotine content is determined by several things, including the specific cultivar, the climate during the growing season, soil conditions, such as nitrogen content, and the length and conditions of the curing cycle. Virginia types have nicotine contents ranging from fairly low to rather high, depending on these factors. Though blenders will generally try to maintain a relatively consistent nicotine level in their leaf sources, it’s always possible that one vintage’s product will be higher or lower than another’s. This could account for some of the differences people experience with aged blends; the older sample may simply have had higher nicotine concentration when it was produced. Over the short term, aging tends to lower the pH (increasing acidity) of the smoke, which is part of what accounts for the fact that moderately aged tobaccos are perceived as smoother and less harsh than fresher samples, but over the long term, something else, other organic or biological processes, may be taking place that raise the pH (increasing alkalinity). One possibility is that there is a conversion of some of the natural organic acids present in all tobacco, such as malic acid, into simpler, weaker acids in a process similar to the malolactic fermentation that some wines are put through to "soften" their sharp edges. Though I have been unable to find any research directly pertaining to this, I have noticed the distinctive aroma of this fermentation in some aged tobacco samples. There are other conceivable factors, as well, but that’s likely enough hand-waving for now. One thing is certain; what’s going on in those little sealed biospheres is fascinating, complex, and only partly understood, as, to my knowledge, no one has yet done a detailed analysis on very long aged samples of specific tobaccos, but we can be sure of at least two things: that actual nicotine levels do not increase, and that aged tobacco is a deliciously Good Thing (TM), providing it was good to begin with. From Olivier: First of all, I’d like to thank you for the excellent work you do writing your monthly columns. I always look forward to reading you and learning new things about our hobby. Now, here is my question: Why is it that I can sit down with a relatively small pipe and puff at a steady pace, producing a very decent volume of smoke for an hour or sometimes more and yet, the exact same amount of tobacco from a hand rolled cigar with a ring gauge similar to the diameter of the pipe’s tobacco chamber will only last about fifteen minutes? I thought about airflow, thickness of the leaves, burning surface and temperature but cannot figure that one out. A: That’s a great question, and not an easy one to approach. The short answer is that it’s all about the combustion mechanics of the two devices. Beyond that, it’s time for more hand-waving, WAGs (wild assed guesses), and a little TIC (tongue in cheek) analysis. First, a cigar is a fairly efficient device for combustion. The airflow through it is relatively unimpeded and linear (if the cigar is rolled properly), and the exit orifice has very nearly the same surface area as the cigar’s average cross-section. Further, the "cone" of combustion is significantly large relative to the cross-sectional area of the cigar. Some of the moisture that evolves during combustion will simply evaporate, whilst some will deposit itself in the leaf behind the ember. As the cigar is smoked, it tends to "cruise" between puffs, no doubt a result of its even airflow and the corresponding influences of fluid dynamics. 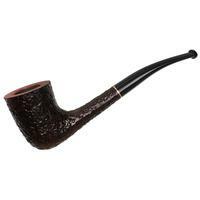 In a pipe, on the other hand, the airflow through the tobacco is less consistent, and being channeled through a small orifice at the bottom of the bowl would tend to make combustion less efficient. 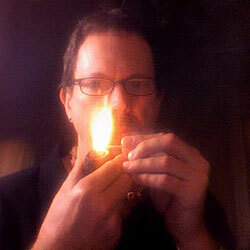 Additionally, the pipe’s walls affect the characteristics of the burning ember, resulting in a "cone" of combustion that is not nearly as enlarged as that of the cigar. More moisture tends to stay within the tobacco beneath the ember, which we generally experience as the pipe becoming more difficult to keep lit as we reach the bottom of the bowl. (The appearance of ye old soggy dottle at the end of a bowl is sometimes an egregious, and smelly testament to this phenomenon.) 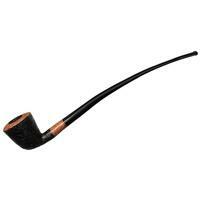 And, between puffs, the pipe’s combustion temperature drops significantly. Most of us tend to sip our smoke gently and slowly. 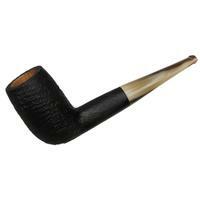 Looking at it this way, and considering that most people tend to puff cigars harder, whilst taking slow, measures sips from the pipe, we’d expect the cigar to burn faster, more efficiently than the pipe. But, the difference is still a little unsettling. To gain a tiny bit more insight, I chose a pipe and a cigar with similar diameters, and took some measurements. Of course, one sample does not define a trend, but the results might be interesting. I smoked the cigar, maintaining a fairly consistent puffing rate, measuring its length at 10 minute intervals, and observed a couple of interesting things. First, as the cigar was smoked, the rate of consumption decreased during the first half, starting at about 0.18cm/min, and decreasing to about 0.08cm/min at the 40 minute mark. At this point, about half the cigar was consumed, but the cigar went out. Further measurements would be skewed, so I stopped recording them. Recalculating, the density of the half-smoked cigar was approximately 0.38g/cc, slightly lower than that of the unsmoked cigar. I’d expected it to increase, as the moisture of combustion should have added weight to the remaining tobacco. My guess, here, is that either the roll is inconsistent, or that moisture was evaporating faster than it was being adsorbed, or, more likely, some combination of these factors was at work. On to the pipe. The smoke lasted for a bit over 40 minutes. The first half of the bowl burned away in the first 15 minutes, meaning that the rate of combustion, as with the cigar, decreased as the tobacco was smoked. We know that pipe tobacco does take up increased moisture as it’s smoked, the result of combustion moisture and other distillates accumulating in the tobacco and on the surfaces of of the pipe. My guess (this is the WAG part) is that a combination of combustion efficiency coupled with adsorption of moisture results in the pipe providing a longer burn time for any given volume of tobacco. With that, I think it’s time to take a deep breath, wring my hands whilst cackling in a well practiced mad scientist manner, close the book on this month’s column, remove the "Ask Doctor Science - He Knows More than You" shingle from the front door, and return to my fantasy world as Certified Master of the Universe. (If you don’t get the reference, you either have a short memory, or simply haven’t been reading this column long enough. Back issues are available. You’ve got a month to catch up.) Come, Igor. We have work to do. Outstanding and illuminating as always. Thanks for sharing your knowledge. I wish we had something like this 40 years ago. Happy Smoke Rings. On Olivier’s Cigar V Pipe race could a factor be that the tobacco used in cigars and pipe mixtures have different burning characteristics due to both their chemistry, cut and moisture level? Not sure how you could measure this but pipe tobaccos certainly vary in burning speed and I suspect if you selected one of the quicker burners it would be much closer to the cigar burn rate. I do not select tobacco for quick combustion but I happened on one that fits the bill - La Brumeuse Semois would need little handicap to race a cigar. Any enticing teases on the new blend and roughly when might it be due? Absolutely! 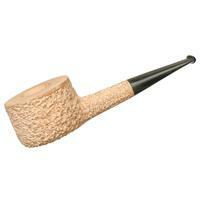 Different tobaccos would certainly make a difference, but that difference wouldn’t be as dramatic as it might seem. A 2:1 ratio of time from a slow burning to a fast burning leaf seem unlikely. The moisture content, on the other hand, is certainly a significant factor, as is the packing density. Semois’ biggest contribution to its burn rate is the lack of moisture. But, my experience with it is that I smoke it VERY slowly to keep from toasting my tongue. As for packing density, I know people who routinely get much more smoking time from a pipe than I do, but they also pack it much tighter. 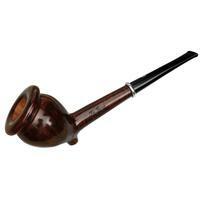 Since my packing seems to be on the loose end of things, the difference between a pipe and a cigar would likely only increase. One of the things I’ve been thinking about is observing more closely is the smoking characteristics of a given tobacco at different packing densities. That should keep me off the streets and out of trouble for a while. Once again, a good article. I found La B to be weirdly both very fast and quite cool smoking: taste was a mixture of burley coco footnotes and marked floral top notes - a sort of smokable version of Lakeland (yuck) tobacco. Apart from backing it as a fast smoker it baffles me at the moment and your finding that it smokes hot just adds to the questions. Several other thoughts on the causes of the varying rates of cigar and pipe combustion. Is one possibility the density of pack as the combustion has less space to jump; in your experiment the cigar had about sixty six per cent more tobacco per cc than the pipe? Another might be direction: in pipes combustion goes downwards but even matches do not burn downwards so some of the impetus of the airflow could be lost overcoming this effect. A final factor might be availability of oxygen; the point of combustion in a cigar is surrounded by oxygen but as you smoke down in a pipe the oxygen source is further and further away and the rising hot gasses are pushing it up and away from the smouldering tobacco. What puzzles me about your experiment is that if your cigar was not absorbing quite a bit of moisture why was the speed of combustion halved while you smoked it? I suppose, as you suggest, the second half must have been sufficiently lighter in the first place to absorb the moisture and still be lighter. Is the symbol on the t-shirt in the picture a version of the molecular structure of nicotine - not sure as I can see too many N atoms - but it could be the fold? Thanks for an exceptionally interesting article this time ’round! I’ve used them a lot over the last year. With non aromatics, they work great for absorbing moisture. The more loosely packaged the tobacco, the better. You have to maximize the surface area exposed to the air where the Boveda is. In a tightly packed Ball jar, you can expect only the first quarter inch to dry out. Aromatics, though, don’t fare as well. The Boveda packets absorb the volatiles as well as the moisture, so you end up with an aromatic Boveda packet and non-aromatic tobacco. I’ve also observed some weird chemical reactions between the Boveda packet contents and some aromatic additives, leaving an odd and unpleasant aroma. The reverse function of using Boveda packets to humidify dry tobacco works OK, but it is slow. Again, the tobacco should be spread out in a thin layer. I don’t recommend doing this in a plastic bag. Water vapor seems to pass through the bag faster than it is absorbed by the tobacco. A Mylar laminate bag or glass jar works best. Thanks again for the brain food. I recently got my father back into pipe smoking. He used to nearly exclusively smoke Drucquer and Sons “Temple Bar”. I understand that you used to blend for them. Would you have a blend of yours that you could recommend that would be similar to what Temple Bar was like? Having never tried it, I am not able to really help my father out. Also, would you happen to know anyone that would have a small tin of Temple Bar sitting around? I’d like to give my father one last smoke of his favorite blend before finding a replacement for him. Thank you sir. Mr. Pease, first of all accept my apologies for not posting a comment earlier. I only came across the article earlier this week. Thank you very much for answering my question with such a scientific approach. It just proved that next time I have one of those questions, instead of pondering on it for days or months I just have to roll up my sleeves and get to the core of the matter! In your answer (which is much more detailed than what I expected) one clear element came to mind and it is the “fire triangle”. I think the answer of pipe vs cigar dilemma lies in the two sides of the triangle associated with heat and oxygen. The third side being fuel, if we consider the same amount of tobacco at the same humidity level, than the difference can only found in the other two sides. In our case, the briar chamber restricts the oxygen flow much more than the open ended tip of a hand rolled cigar and also the heat is significantly different (more constant heat for the cigar vs fluctuating heat for the pipe). Once again, thanks for your time and your rigorous analysis and I wish you the best of luck with the release of the new Six Pence!